Detroit Marine Diesel 8V92 Twin Turbo 735HP Newly Rebuilt 250 HRS. Thruster Hydraulic Package with new pump. Included Propeller 47 x 36 pitch. 10,000 +Lbs Thrust $95,000. 2 Used self contained units. Manufactured in 2013. These units are 293HP Isuzu Powered (102 hours of service). Out of business sale. Units are wired to dual pilot house control and can both be operated from the pilot house. Units are also equiped with optional 360 degree steering and extended reach (allowing 9.5 feet from deck to centerline of propeller. Vertical adjustment up to 6 feet. Selling price $125,000.00 each - $250,000.00 for the pair. Units will be gone thru at our facility and verified all systems at peak performance. In production 175HP Perkins Powered Single Thruster with Helm Controls. $79,995.00 Options of Pilot house Controls available at additional cost. 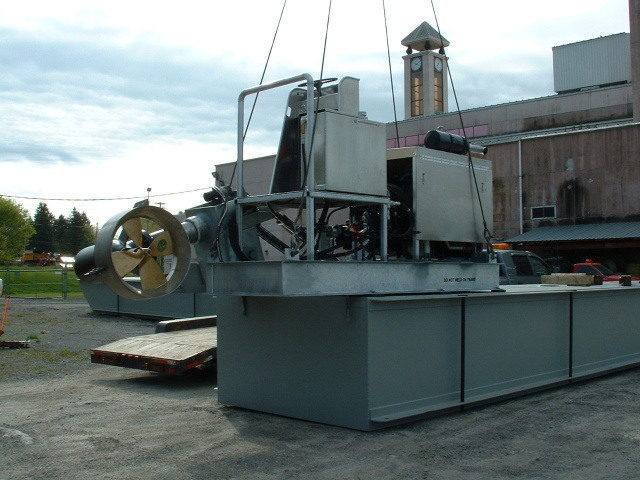 Reconditioned 150HP self contained (turn key ready) Hydraulic Thruster. 150HP factory remanufactured Deutz 914 air cooled Turbo Diesel Industrial Engine. Hydraulic pump, motor complete rebuild, Helm controls, 180° Steering, Hot dipped galvanize frame & stanchion tube. Propeller depth adjustable to reach of 9.5 from deck to centerline of propeller. Helm platform, Hydraulic tank and Fuel tank made of marine grade aluminum. 24 inch 4 blade manganeze bronze propeller with matched stainless steel nozzle, easily transportable. Warranties Included, lease option to purchase, call 386-734-0020. This Diesel powered, hydraulically operated 'Silver Tsunami'® Thruster has a quick set-up time (60 minutes) and is suitable for a varying range of platforms from 4' to 8' deep. The Thruster is fully hydraulic, with no drive shafts, gear boxes or transmissions. The thruster propeller is controlled with a Sauer-Danfoss Variable Control Electronic Joystick. This unit can go from full forward to full reverse in 1.5 seconds. Steering is controlled from the Helm with a steering wheel and the unit steers 180° +/- (90° left/right). The unit is easily truckable and has a weight of approximately 7,100 lbs. Installation is quick and easy. The unit sits on weldable steel deck mounting pads, 1" thick. The pads are bolted to the bottom of the frame. To install the unit, lift it into position on the deck, weld the pads down and you are ready to operate! If you need to transfer the unit to another platform, simply un-bolt the unit from the pads, bolt on another set and repeat the process. VOLVA PENTA Tier IIIA Turbo-Diesel Industrial Radiator-cooled engine with helm mounted Engine Control panel including instrumentation; Sauer-Danfoss 90 Series Heavy Duty Tandem Variable Hydraulic Pumps and Fixed Motors; Extended Reach capability, allowing 9.5' to centerline of propeller from mounting deck; Kaplan 24" 4-Blade Propellers with matched Stainless Steel Nozzles; Hot-dip Galvanized Structural Steel Frame; Aluminum Helm, Hood and side access doors; Aluminum 100 gallon fuel tank; Aluminum 80 gallon hydraulic tank package; Eaton-Vickers Return filtration system with spin-on Filter; Fan mounted Hydraulic Oil Cooler; Dual Hydraulic Horizontal Tilt Cylinders with Stainless Steel Rods; Manual vertical depth adjustment up/down 6'. 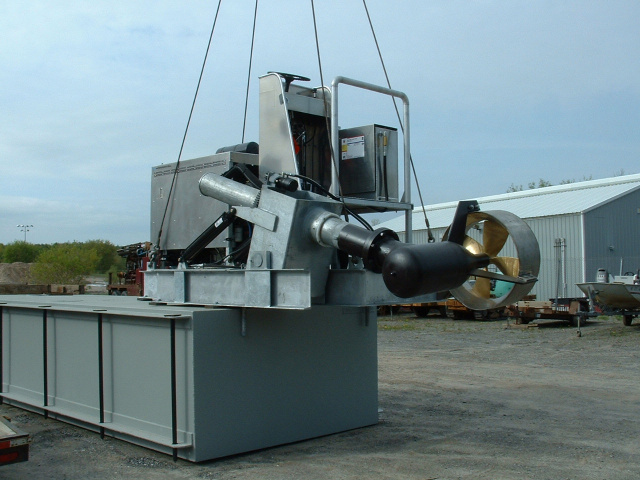 This Diesel powered, hydraulically operated Dual propeller 'Silver Tsunami'® Thruster has a quick set-up time (60 minutes) and is suitable for a varying range of platforms from 4' to 8' deep. The Thrusters are fully hydraulic, with no drive shafts, gear boxes or transmissions. The propellers are controlled with Sauer-Danfoss Variable Control Electronic Joysticks. The propellers can go from full forward to full reverse in 1.5 seconds. Each propeller is independently operated, allowing one to be in forward and one in reverse at the same time. Steering is controlled from the Helm with a steering wheel. The propellers are linked together (with a steering rod) and steer in tandem. The 90° left/right steering range, combined with independent forward/reverse operation allows the platform to be extremely maneuverable. The machine is easily truckable and has a weight of approximately 10,600 lbs. Installation is quick and easy. The unit sits on weldable steel deck mounting pads, 1" thick. The pads are bolted to the bottom of the frame. To install the unit, lift it into position on the deck, weld the pads down and you are ready to operate! If you need to transfer the unit to another platform, simply un-bolt the unit from the pads, bolt on another set and repeat the process. - Engine completely over-hauled / full rebuild 2013. current 50 hrs. on rebuild. This Push-boat Vessel is ready for immediate service (5/2014). Can be truckable (with pilot house removed).